What could Cameron Crowe possibly have been thinking? As a writer and director, he is at least idiosyncratic (his last movie was “We Bought A Zoo”) and sometimes incomprehensible (consider “Vanilla Sky”), but then he’s also done the wonderfully entertaining “Jerry Maguire” and “Almost Famous.” Here, he wrote some interesting characters, hired A-list actors, filmed in a beautiful location…and created a movie that’s a mess. The story keeps wandering around without cohesiveness, comprehension, or a sense of direction until it all devolves into a plot that seems borrowed from a 1960’s James Bond film. 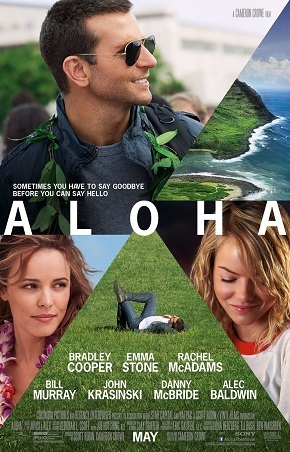 At the center of this movie is a former soldier-turned-military-contractor who returns to Hawaii and reconnects with a former love, while trying to deny his obviously-growing affections for a hard-charging Air Force Captain sent to be his bodyguard. The problem is – that simple story is covered with layers of mumbo jumbo about the night sky, Hawaiian traditions, and an irresponsible billionaire who wants to control space. And all of that becomes a constant distraction – and what could have been a quiet, plausible, entertaining, and emotional romance turns into a gobbledygook of mythical and futuristic nonsense. Still, there are some nice moments and empathetic characters. Start with Emma Stone. With her ramrod posture, energetic stride, and warm smile, she (to quote a line from “Jerry Maguire”) “has us at hello.” Rachel McAdams makes her character a woman of mixed emotions and Bradley Cooper is good as a man torn between two loves. Murray and Baldwin are wasted in the film, but in a small supporting role, Danny McBride is a hoot. Cameron Crowe knows how to use music to create a mood and complement a plot and there are several interesting uses of Hawaiian music here. But in the end, it seems like he was trying to combine too many disparate elements – myths and the military, constellations and independent contractors, romance and parental reckonings. A simpler story – set to the beat of a slack key guitar — would have been much more entertaining.